As of late, I have decided to focus on writing timeless posts, because the only thing I seem to be able to write punctually are the Doctor Who reviews. So that is what I will do for now, or at least until series 8 is over this Saturday week, and then I won’t have tons of drafts of movies released months ago with only the title written down. I recently shared my favourite songs from TV shows. Not the intro themes, but songs that had been played at some point in an episode and become extremely popular. This time, I have decided to move on to the big screen and share my favourite songs from movies. And this time they are indeed the main theme songs. Needless to say, this is not an objective list. If any of these songs is here is because they have a special meaning for me, because I first listened to them at a significant moment in my life or simply because I enjoy humming along. Just bear with me if you are a girl, because most of them are from male-oriented movies. This must be the most famous James Bond theme song and perhaps the most associated to the character. While it is not the first 007 song I ever heard (that privilege belongs to Nobody Does It Better, from The Spy Who Loved Me), it is by far one of my favourites, and not only because it is performed by an ex-Beatle. Just press play and close your eyes. Listen to the instrumental bridge and try to deny that you are picturing James Bond (the one of your choice) jumping up and down doing, err, Bondy things. First things first: when Paul Newman died, I cried like a baby (and yes, I was already a 20-year-old grown-up) because he was one of very few people to be great at their job and also extremely altruistic and kind. Who knows when the world will have someone like him again. This movie and The Sting have been listed among my favourites since I was a kid, and I must confess that this song brings me special memories because I used to make video montages of my cat with this song (don’t worry, I was younger than 20. Although not that much younger, I should admit). The scene of the film that features this song gave a new meaning to bike riding and it was one of the most adorable moments ever captured on film. And even though listening to this song reminds me of the much-missed Newman and my late cat, it is so lively that it always puts a smile on my face. Oh, I love, LOVE this song; it always puts me in the mood! I also happen to be a huge fan of this movie and its soundtrack, so this one had to make the list. It wasn’t written specifically for the film, but it clearly became popular because of it. In Scorsese’s masterpiece, you can hear it twice, and both times it adds power to the scene. First, after the ‘cold open’, when Dicaprio’s character is sent to prison, and later on it plays again when they are heading towards the first climax of the movie. I just watched the scene and I am already jumping with excitement. Now if you will excuse me, I am going to spend the next two and a half hours re-watching this movie. See you in a bit. Hey, you are still here! I am going to change the genre a bit with what is the first musical I ever watched and probably my favourite one. By the time I was 6 or 7, I could sing and dance every musical number from this movie (in my mind, I was singing the songs in a perfect English, of course). To be fair, I could have chosen any song from any Gene Kelly musical and it would have worked. SITR has other songs that I adore, like All I Do is Dream of You or You Were Meant for Me, but there is nothing more iconic than Don Lockwood under the rain. Fun fact: many of you probably don’t know this, but none of the songs were originally written for this movie. In fact, SITR is kind of a Moulin Rouge type of musical, in which all the songs are borrowed from previous films. This one in particular is from The Hollywood Revue of 1929. Like every respectable girl, I have been obsessed with Audrey Hepburn as far back as I can remember, because she was pretty much like Paul Newman: excellent actor, even better person. Of course, this is her most emblematic movie, even though she has many other great titles in her filmography. Henry Mancini (of Pink Panther fame) composed the song and created the entire score around this tune, so there is no doubt that Moon River will always be associated with this romantic comedy and Audrey playing the guitar. Okay, so this song is from 1972 and it was already famous back then, but it was given a boost in 1996 when Danny Boyle used it for a now-iconic scene from his movie Trainspotting. Ewan McGregor’s Renton shooting up with heroin and getting high (and subsequently overdosing) would not have become such a poetic and captivating sequence without Reed’s music in the background. Superb. This is such a silly choice, but That Thing You Do! (or The Wonders, as it was called in Spain) was one of those films that got stuck in my head when I was really young (9 or 10 years old) and I would watch them over and over again. The film is so chipper, so sparkling, it’s set in the 1960s and there is upbeat music intertwined with the story. What’s not to love? And the film is directed by Tom Hanks, a man so beloved that when the US Government loses its credibility, it borrows some of his. Of all the songs, this is of course the main one, the theme that gets to you. Watch the movie and you will sing and dance this song for days. Or in my case, for decades. 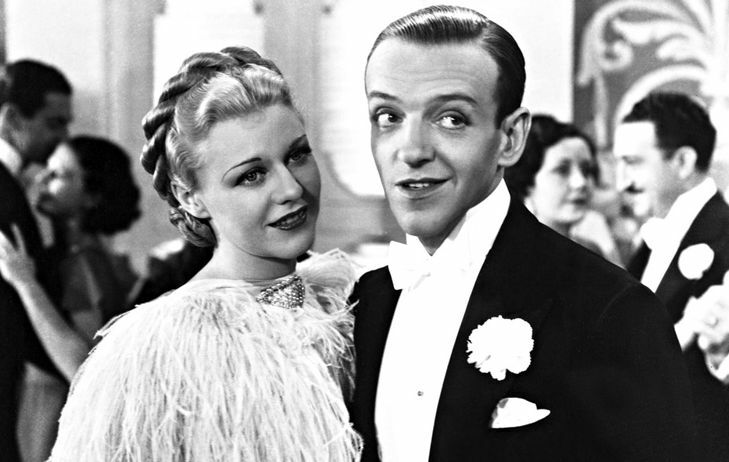 -Let’s Call the Whole Thing Off, by Fred Astaire and Ginger Rogers, from Shall We Dance, 1937, or Cheek to Cheek, from Top Hat, 1935 (that dancing sequence always leaves me speechless). –Walk the Line, by Joaquin Phoenix, from Walk the Line, 2005 (needless to say, this is a movie about Johnny Cash, so all the songs are his greatest hits, therefore not written specifically for the movie). –Vois Sur Ton Chemin, by Les Petits Chanteurs de Saint-Marc from Les Choristes, 2004. -Come What May, by Ewan McGregor and Nicole Kidman, from Moulin Rouge!, 2001. –You Never Can Tell, by Chuck Berry, from Pulp Fiction, 1994 (again, it was an old song that became popular again thanks to the movie).